How can your virtuous act become evil in the sight of God and men? When you fail to add knowledge to your virtue, you will not be guiltless in the presence of your observers. For example, although it is virtuous to be of help to your neighbor, particularly those of the household of faith, stealing to help a brother or sister who is in need is “assistance” without knowledge. In like manner, “helping” a woman become pregnant because her husband has low sperm count is misplaced “help” that will lead to hell fire. When we exercise knowledge in such a way that the weak in spirit are discouraged and backslide, such knowledge is destructive. It was the application of temperance that prevented the Lord Jesus Christ from calling down fire upon those who resisted His entering into their village, after two of His disciples suggested it and even though He knew He could do so (Luke 9:51-56). May the Lord add to your faith, the necessary virtue, knowledge and temperance in Jesus’ Name. Prayer Point: Father, please cause me to grow in grace, knowledge and self-restraint for profitable Christian living in Jesus’ Name. Hymn 15: Nearer My God To Thee. Open Heavens 8 February 2018, Daily Devotional guide was written by Pastor E.A. 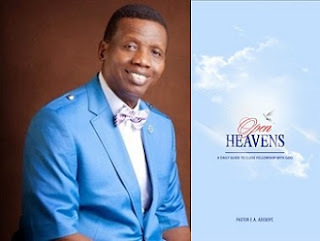 Adeboye, the General Overseer of the Redeemed Christian Church of God, one of the largest evangelical church in the world and also the President of Christ the Redeemer's Ministries.